Many destinations gain an unwarranted reputation as being dangerous or “un-cool” for visiting. The truth is that you can go to most places; you just need to take the right precautions. Many once ignored locations are fast becoming the most sought-after and “cool” holiday spots among travellers. As a traveller, you need secure a thorough risk assessment before departure, engage with expert local guides who know the current situation and build in flexibility and contingency plans. Colombia is trying hard to shake off a reputation tarnished by decades of civil unrest and drug trafficking. In reality many parts of the country have been free of these issues since the early 2000s. The economy is booming, to the extent that many have labelled it one of a new wave of emerging nations, along with countries like Indonesia and Kenya. It has a young population (a bi-product of civil war), eager to make up for lost time. settlements, archaeological ruins, Amazonian jungles, rolling plains, buzzing cities and desert islands. Indeed, Colombia is said to have one of the highest levels of biodiversity found anywhere. However, if man-made beauty is more to your liking, the city of Medellin was named ‘World Capital of Innovation’ in 2013. Potential visitors should remember that problems do persist in the more remote areas, and there is still huge inequality between the poor ‘campesinos’ and the rich elite, mainly of European origin. So many people have been affected by the tragic recent history of Colombia – it is important to hear their stories and learn the lessons from them. There once was a good reason Colombia topped the list of ‘world’s most dangerous places, but things change, and often rapidly. As for the best time to visit, it depends what you’re looking for. The busiest months of November to April create a buzzing atmosphere in the most popular spots, but there is usually somewhere more tranquil to escape to. If you can, leave it to April or May, which still offer great conditions but more room to breathe in Colombia’s natural beauty. Arriving in the sprawling capital Bogota might not do much to change any preconceptions you might have harboured, but the more you scratch the surface, the more rewarding Colombia becomes. Romania has a reputation of having a somewhat feudal system in place. And whilst it’s true that parts of the country are like stepping back into time, this is a huge part of Romania’s attraction, rather than a trait to scare visitors away. Romania provides stunning hiking opportunities in the Carpathian Mountains. And in terms of cool-factor, it doesn’t get much better than seeing bears in the wild, hanging out with counts that can trace their lineage back to the time of Dracula, or racing Ferraris down ‘the World’s best road’. We certainly think this is an undeserved reputation. For those wanting something even more remote and unusual why not head to Afghanistan? 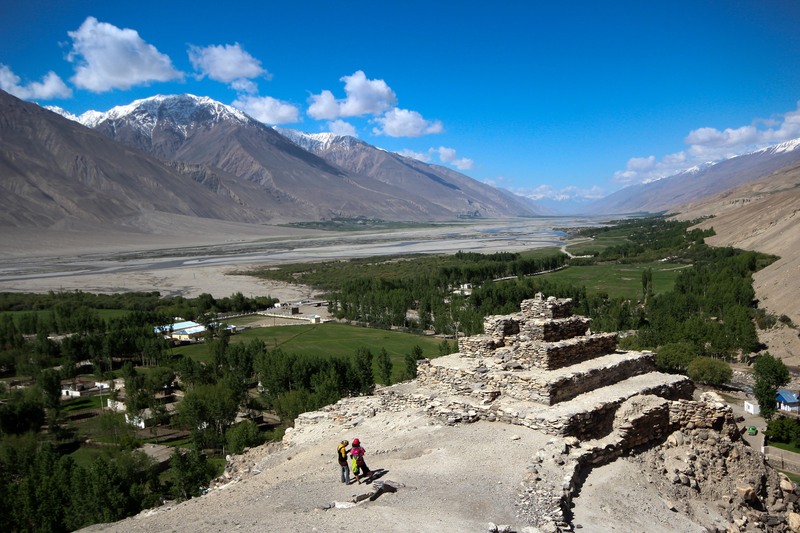 The Wakhan Corridor in the far northeast is an adventure playground that very few people have explored in recent times. Despite seeming terrifying due to the recent war, it’s a great place for trekking and climbing and it’s inhabited by some of the most friendly and photogenic people on the planet. Climb ancient mountains to stare across vast open plains, drink tea with a herdsman (as your guide translates); sleep outside and underneath the stars of one of clearest skies around. On your return you’ll be able to wow your friends and family with tale of a land typically visited by troops for most of this century. The key to making any project work is doing a thorough risk assessment, getting good up to the minute local intelligence and keeping things very flexible. Studying any list entitled ‘the world’s most dangerous places to travel’ will invariably throw up countries like Honduras, Guatemala and Venezuela – those that are said to have the highest homicide rates in the world. But this is really doing them a disservice. Once out of the entry cities (e.g. Tegucigalpa, Guatemala City, San Pedro Sula or Caracas), each country really has a huge amount to offer. Think helicopter flights to remote Mayan ruins hidden in the jungle, indigenous villages close to the world’s highest waterfalls, pristinely preserved colonial cities, and idyllic Caribbean beaches with some of the world’s best diving. The mystery and allure of Myanmar is still largely untouched as it is only just opening up to outside visitors, making it the perfect destination. Travel outside of the main tourist areas is still not advised as fighting with several rebel groups is still ongoing however that should not discourage people from visiting. Most travellers will have the time of their life in Myanmar, the sights are some of the most amazing in the world and the people are some of the friendliest. From the temples and pagodas of Bagan to the history of Rangoon, Burma has a lot to offer. Political demonstrations are still fairly common, despite the move towards democracy; visitors should be advised to stay clear of these and avoid taking photos of any demonstrations, the police or military facilities. Following the devastating earthquake in 2010 and subsequent cholera outbreak, Haiti has all but been invisible to tourists. Now however stability is returning and Haiti is slowly opening up to visitors once again. Travel restrictions recommended by the UK and US have now been lifted in the most part, although in certain areas of Port-au-Prince political demonstrations are still ongoing – and are best avoided. It is a country steeped in history with fantastic natural sites and even though plenty was destroyed in 2010 there is still a wealth of things to see and do. Explore deserted beaches, dine on sumptuous seafood and perhaps even take lessons at Haiti’s first ever surf school. Haiti’s history and involvement with the slave trade has meant that it’s kept closer to its African roots than any other Caribbean nation, a legacy that’s ever present in its vibrant art and music scenes that even the earthquake could not dampen. Rumours persist about Ulan Bator being the world capital for thieves and pickpockets. While it’s true that travellers must take some care when walking alone at night the city, is a fantastic place to visit. Discover Choijin Lama Monastery with its centuries of Buddhist history; spend hours wandering through Bogd Kahn Museum – originally built as a palace for the king but now filled with artefacts and works of art covering the last 400 years. For something more modern and exhilarating, head to the Sky Resort and visit Mongolia’s premier ski resort. Visitors may think of the Wild West in Mongolia, as law enforcement is fairly uncommon and drunken brawls have a habit of breaking out after people have had a couple of drinks. But given that the Mongolia people are descended from Attila the Hun, one might say it is in their genes. Despite their fearsome warrior reputation, Mongolians are in fact some of the friendliest people on the planet who love nothing more than helping strangers. Nevertheless Ulan Bator is one of the safest cities in the world and the opportunity to get to know the happy locals and this city’s long history make everything worth it. If you are interested and would like a hand-crafted trip, bespoke to you, to one of these destinations, please call +44 (0) 203 358 0110 or contact us for more information.